Dubai: The temporary exemptions on travel exit clearances for Filipino workers starts on Thursday (September 15), but a senior labour official reiterated that only certain groups of workers and not all Filipinos are exempted. Filipino workers who go back to the Philippines are required to secure a travel exit clearance called Overseas Employment Certificate (OEC) to prove that they have been hired legally and intend to go back to the same employer abroad. This Philippine government requirement is presented to immigration officers before leaving the country and also to get travel tax and terminal fee exemptions. Labour officials in Manila last month decided to exempt certain workers from getting the exit clearance as instructed by President Rodrigo Duterte to streamline processes in deploying Filipino workers abroad. The exemption is on an experimental basis that will last for a month beginning September 15. 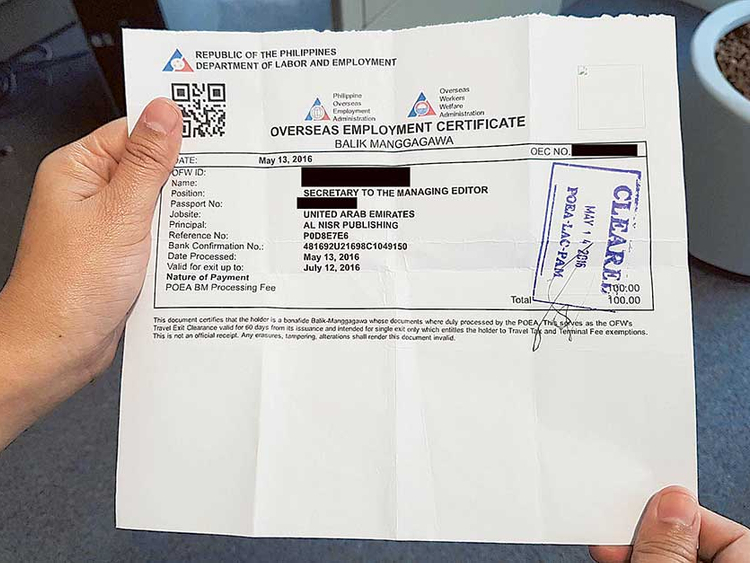 “The Governing Board resolution is clear that there are only two groups who are exempted: those who are returning to the same job site or employer abroad and those who were processed through the government placement arrangement provided they have existing records with the Philippine Overseas Employment Administration (POEA) database through the BM Online Processing System,” Labour Attache Ofelia Domingo told Gulf News. According to a POEA memorandum circular No 06 issued on Wednesday, all returning workers with prior records with POEA must still update their records online before their scheduled date of return to their employers. Their records will then be electronically submitted to the Bureau of Immigration in Manila so they can pass through with just a valid passport and valid visa. The memorandum also clarifies that registered workers who have updated their profiles with BM Online and are returning to the same job sites will see that the system “will display a confirmation message indicating that the worker is exempted from securing the OEC and payment of processing fee”. Those who are not exempted (SEE LIST BELOW) will be directed to the appointment service so they can get an exit clearance. Domingo reminded Filipino workers to check whether they are exempted or not before going to the airport to avoid any inconvenience. Those who need help may seek assistance from the POEA Labour Assistance Centre at the Departure Area. The exit clearance exemption is expected to benefit an estimated 600,000 overseas Filipino Workers (OFW) every year. Up to 7,000 OEC applications are processed daily during peak seasons like Christmas holidays and school graduations.